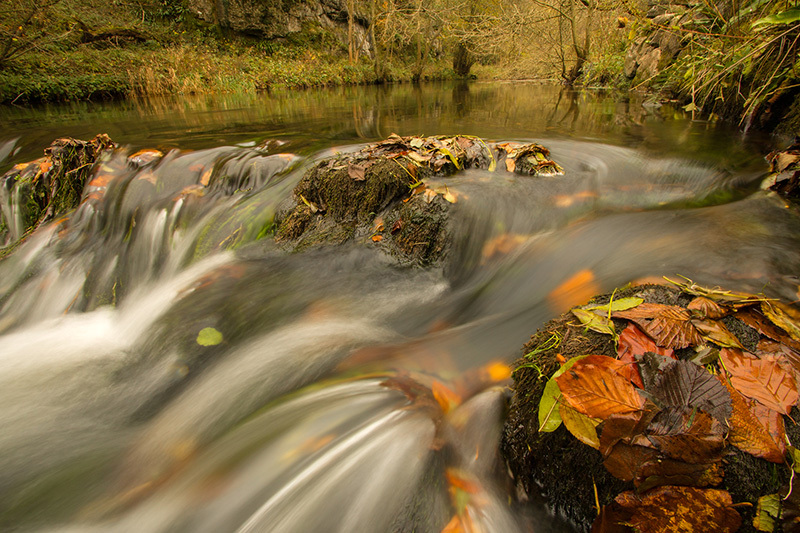 An overcast morning in late October offered potential for photographing waterfalls and saturated autumn colours. I found this scene about 30 minutes walk up Dovedale in the southern Peak District. It took rather more time to fine tune the composition to give the right balance between rushing water in the foreground and the tranquil riparian background. The leaves required a little encouragement to stay exactly where I wanted them. Stopping down to F/20 gave an 0.6 second exposure, without the need for a filter, just right to pleasingly blur the motion of the water. The remaining challenge was to keep tiny droplets of water spray off my lens for those 0.6 seconds.